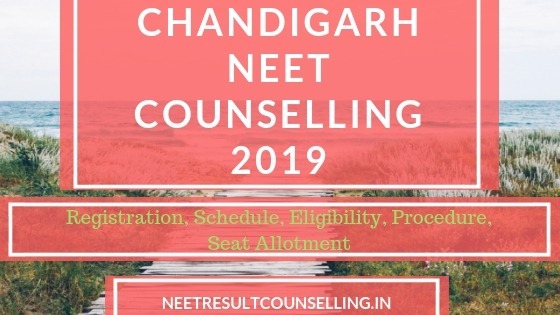 Chandigarh NEET Counselling 2019 for 85% state quota seats is expected to start from 6th June 2019. 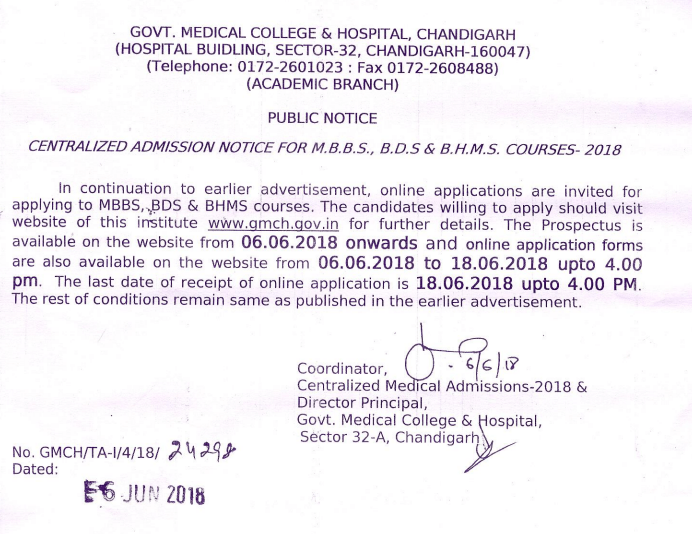 Recently, Government Medical College and Hospital, Chandigarh announced the schedule of online form filling for NEET 2019 State quota admission. Through the NEET UG centralized state counseling, candidates will be granted admission into MBBS/BDS/BHMS courses in the various Medical and dental colleges of Chandigarh. Centralized counseling in the state of Chandigarh will be conducted and managed by Government Medical College and Hospital, Chandigarh. 1.4.1 Who is eligible for Chandigarh NEET Counselling? In this article, we have shared all the necessary details related to Chandigarh NEET state quota counseling 2019. The schedule given above is prepared on the basis of the last year’s information. The official schedule will be updated soon. Who is eligible for Chandigarh NEET Counselling? Candidates must have attained an age of 17 years on and before 31st December 2019. Candidates who want to apply under the category of All India Quota and UT Chandigarh must be an Indian citizen as the candidate of other nationality is not eligible. Candidates must have qualified 10+2 exam or equivalent with Physics, Chemistry, Biology/Biotechnology and English as a subject from a recognized Board. Lastly, candidates whose name will be there in NEET 2019 merit list will be eligible for NEET counseling. Candidates have to visit the official website of the GMCH, Chandigarh (mentioned above). Now candidates have to fill the application form by filling valid information. After filling all the details candidates have to take a printout of the challan form. Now candidates have to deposit an application fee. To complete the application procedure candidates have to submit the printout of the filled-in application form and fee challan along with the required documents in GMCH, Chandigarh by the due date. Lastly, candidates have to collect receipt of the submitted form. Application fee can be paid only through the bank challan. *Candidates can claim the reservation seat only if he/she possess a relevant certificate. The first and most important step in NEET counseling is the registration. Candidates have to fill an online registration form to be eligible for counseling. The application form will be released only through online mode along with the prospectus. After filling all the details in the application form, candidates have to make payment of the fee and have to submit the application form along with all the required documents. On the basis of merit and details filled on the application form, a list of eligible candidates will be prepared and displayed online. Candidates now have to report to the counseling venue on the specified date and time along with all the required documents. After the verification of documents and completing all the formalities seats will be allotted to the candidates in their preferred course. Candidates who will not be allotted any seats in the first round can apply for second round counseling and can get a seat in their preferred course. After the completion of counselling process candidates have to report to the allotted college where they have to go through a medical examination. Admission will be confirmed only after the result of the medical examination and payment of the admission fee. Only medically fit candidates will be granted admission. The application form will be available only on the official website of GMCH website. No printed application form will be available. Separate application forms will be filled for all the three courses. If any candidate has applied for all the three courses then he/she has to submit application fee separately for each course. If a candidate has been granted a seat in a college then he/she will not be eligible to appear in subsequent counseling. Admission will be provided to the candidates only on the basis of merit, which means only on the basis of NEET score. Candidates have to submit all the documents to the address given below before the due date. We hope that the information was useful. Keep visiting our page for more updates related to Chandigarh NEET 2019 state quota counseling.